Across the Board: Haikal sharp, but Kentucky Derby-worthy? Home / News / Across the Board: Haikal sharp, but Kentucky Derby-worthy? 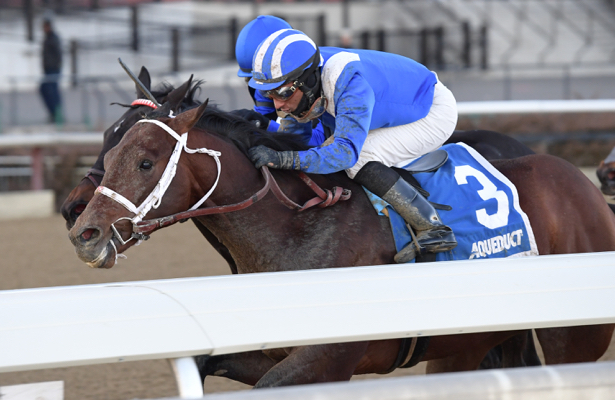 Although the 2019 Kentucky Derby is fewer than eight weeks away, it seems few horses who look eligible to move forward toward that goal were in stakes action this past weekend. One of Saturday’s two stakes for 3-year-old colts and geldings was Aqueduct's Jimmy Winkfield run at seven furlongs. While the promising Haikal won the Winkfield to demonstrate once again that he is a sharp colt who can be tough to beat in one turn sprint races, there was nothing in his game victory on Saturday that suggests he will be just as effective in longer Derby prep races. “We like him,” said trainer Kiaran McLaughlin after the Winkfield. But McLaughlin quickly added: "We need to see more from him when he gallops out after his next series of workouts" to decide if he deserves to stay on the Derby trail. For now, the Gotham Stakes (G3) on March 9 back at Aqueduct is under consideration. In the Sam F. Davis Stakes (G3) at 1 1/16 miles at Tampa Bay Downs, Well Defined used his natural speed to handle a moderate group pointing for the Tampa Bay Derby (G3) next time. That was this colt’s second stakes win, and it was accomplished in his fourth career start at one mile or longer. It came with the addition of blinkers, which underrated trainer Kathleen O’Connell has used effectively in recent seasons. To Well Defined’s credit, he did defeat several promising Derby horses in Saturday’s Sam F. Davis, including the post time favorite, Kentucky Wildcat, who was injured and is off the trail, and Knicks Go, second in the Breeders' Cup Juvenile but off the board for the second consecutive race Saturday. In addition to the two stakes for East Coast-based Derby prospects, there were more than a dozen Derby-eligible 3-year-olds who worked forwardly for their next assignments, which tilts against Well Defined and/or Haikal. Simply, most intriguing Derby prospects skipped over Saturday’s stakes, and in Sunday's San Vicente Stakes (G2) at Santa Anita Park, neither Dessman nor Coliseum were able to defeat Sparky Ville, who trainer Jeff Bonde intends to continue running at a mile or shorter. Looking past the males, a notable Kentucky Oaks hopeful was in action Saturday. I was impressed by Bellafina's fifth victory from her seven starts to date when she took the Las Virgenes (G2) going a mile at Santa Anita Park. While this daughter of Quality Road only beat a relatively small and moderately accomplished field, and it wasn't so visually impressive as we're used to, Bellafina had trained superbly for trainer Simon Callaghan during January and should be the favorite again when she runs next in the Santa Anita Oaks. At the bottom line, all of this filly’s workouts have earned considerable praise, and she has not run a sub-par race since her debut in July of 2018. Rival trainer Bob Baffert certainly was impressed. After Bellafina beat Baffert’s Mother Mother on Saturday, he said: “That’s a tough filly -- very tough." A review of active horses who are enjoying terrific careers led me to examine closely the past performances of a 5-year-old mare that has not received the attention she deserves. That's Hawksmoor, the Arnaud Delacour-trained winner of Tampa Bay Downs' Endeavour Stakes (G3) who has earned more than $1.2 million during her 22-race career in which she has five wins, five seconds and five thirds. At the same time, this ultra consistent turf mare hasn't won a Grade 1 race. Yet, Hawksmoor has finished in the top three seven times from her last 13 starts and eight times out of her 15 races on the grass in New York, New Jersey, Florida, Louisiana and Kentucky. While Hawksmoor probably will not be a candidate for an Eclipse Award, she certainly has helped many horseplayers cash some valuable tickets. Aside from the glamorous divisions that we all like to assess, it is the rare horse such as Hawksmoor who deserves a lot more attention than they usually get throughout the year.